Not to be confused with cactus; nearly all cacti are succulents but not all succulents are cacti. A general definition of succulents is that they are drought resistant plants in which the leaves, stem or roots have become more than usually fleshy by the development of water-storing tissue. Other sources exclude roots as in the definition "a plant with thick, fleshy and swollen stems and/or leaves, adapted to dry environments." This difference affects the relationship between succulents and "geophytes" – plants that survive unfavorable seasons as a resting bud on an underground organ. These underground organs, such as bulbs, corms and tubers, are often fleshy with water-storing tissues. Thus if roots are included in the definition, many geophytes would be classed as succulents. Plants adapted to living in dry environments such as succulents are termed xerophytes. However, not all xerophytes are succulents, since there are other ways of adapting to a shortage of water, e.g., by developing small leaves which may roll up or having leathery rather than succulent leaves. Nor are all succulents xerophytes, since plants like Crassula helmsii are both succulent and aquatic. Those who grow succulents as a hobby use the term in a different way to botanists. 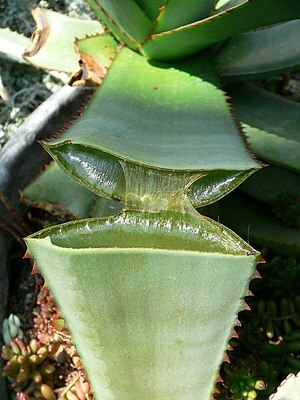 In horticultural use, the term succulent regularly excludes cacti. For example, Jacobsen's three volume Handbook of Succulent Plants does not cover cacti, and "cacti and succulents" is the title or part of the title of many books covering the cultivation of these plants. However, in botanical terminology, cacti are succulents. Horticulturists may also exclude other groups of plants, e.g., bromeliads. A practical, but unscientific, horticultural definition is "a succulent plant is any desert plant that a succulent plant collector wishes to grow." Such plants less often include geophytes (in which the swollen storage organ is wholly underground) but do include plants with a caudex, which is a swollen above-ground organ at soil level, formed from a stem, a root or both. A further difficulty is that plants are not either succulent or non-succulent. In many genera and families there is a continuous gradation from plants with thin leaves and normal stems to those with very clearly thickened and fleshy leaves or stems, so that deciding what is a succulent is often arbitrary. Different sources may classify the same species differently. Other than Antarctica, succulents can be found within each continent. While it is often thought that most succulents come from dry areas such as steppes, semi-desert, and desert, the world's driest areas do not make for proper succulent habitats. Australia, the world's driest continent, host very few native succulents due to the frequent and prolonged droughts. 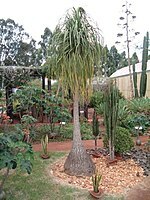 Even in Africa, the continent with the most native succulents, does not host many of the plants in its most dry regions. However, while succulents are unable to grow in these harshest of conditions, they are able to grow in conditions that are uninhabitable by other plants. In fact, many succulents are able to thrive in dry conditions, and some are able to last up to two years without water depending on their surroundings and adaptations. Succulents may also occasionally occur as epiphytes, growing on other plants with limited or no contact with the ground, and are dependent on their ability to store water and gain nutrients by other means; this niche is seen in Tillandsia. Succulents also occur as inhabitants of sea coasts and dry lakes, which are exposed to high levels of dissolved minerals that are deadly to many other plant species. 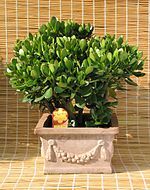 Potted succulents are able to grow in most indoor environments with minimal care. There are approximately sixty different plant families that contain succulents. Plant orders, families, and genera in which succulent species occur are listed below. For some families and subfamilies, most members are succulent; for example the Cactaceae, Agavoideae, Aizoaceae, and Crassulaceae. Edgerton Park Conservancy succulent at dusk. Succulent "wall" in a nursery in San Francisco, United States consisting of Sempervivum, Echeveria and Crassula. Succulents are favored as houseplants for their attractiveness and ease of care. If properly potted, succulents require little maintenance to survive indoors. Succulents are very adaptable houseplants and will thrive in a range of indoor conditions. For most plant owners, over-watering and associated infections are the main cause of death in succulents. 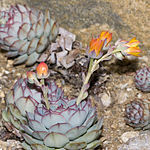 Succulents can be propagated by different means. The most common is vegetative propagation; this includes cuttings where several inches of stem with leaves are cut and after healing produce a callus. After a week or so, roots may grow. A second method is division consisting of uprooting an overgrown clump and pulling the stems and roots apart. A third method is propagation by leaf by allowing the formation of a callus. During this method, a bottom leaf is fully removed from the plant often by twisting or cutting. The leaf then dries out and a callus forms preventing the leaf absorbing too much moisture and thus rotting. This method typically takes up to a few weeks to produce healthy roots that will eventually create new plants. The vegetative propagation can be different according to the species. ^ Dimmitt, Mark. "The Tucson Cactus and Succulent Society". www.tucsoncactus.org. Retrieved 5 February 2017. ^ a b c Compton n.d.
^ "Succulents in their natural environment". ^ "10 Things You Never Knew About Succulents". ^ "Apiaceae". succulent-plant.com. Retrieved 2018-02-07. ^ Parakeelya. The Plant List. ^ Dregeochloa pumila. South African National Biodiversity Institute. ^ "Crassulaceae Genera". Missouri Botanical Garden. Retrieved 2017-10-26. ^ Kramer, Jack (1977). Cacti and Other Succulents. New York: Abrams. p. 9. ^ Kramer, Jack (1977). Cacti and Other Succulents. New York: Abrams. p. 49. ^ Lee, Debra (2007). Designing with Succulents. Portland, Obregon: Timber Press. p. 133. Look up succulent in Wiktionary, the free dictionary. Wikimedia Commons has media related to Succulents. This page was last edited on 21 March 2019, at 14:09 (UTC).